The Rochester Academy Charter School’s second annual alumni dinner was an exceptional success! It was a sight to behold to see the graduating classes of 2012 and 2013 come out and engage in this heart warming event. This year the dinner took place at Red Fedele’s Brook House on January 8, 2014 at five o’clock. The beautiful restaurant with decent decor was complemented by a very satisfying and delicious meal. It was music to the ears of staff and former students alike, to hear the dining room filled with the constant chatter of RACS alumni interacting and enjoying themselves. The night was kicked off by a warm welcome speech by Mrs. Bogan welcoming the alumni and faculty members to the second annual dinner. During dinner RACS Director, Mr.Demirtas, updated everyone about the progression of current RACS students and their achievements. Afterwards, the mic was open to all who wanted to comment on the night, their college experience, and memories from RACS. Mrs. Bogan started the session with making the audience chuckle when reminiscing about Deon Woodie ‘12, “He would fall asleep in class and wake up knowing exactly what was going on in class,” and the outstanding senior trip she took with the graduating class of 2013, “On that trip in that car I got to know my seniors personally and they got to know more about me in that five hour drive.” De’Andre Broussard ‘13 was the first alumni to speak about their college experience, he says “College is hard, but man it is great. College is so great.” He received many head nods in agreement with that statement from the alums who are also in their first year in college. Abdullahi Abukar, a former student at RACS read an inspiring poem about the decisions in the past and how they can affect futures. This poem inspired us all to be able to acknowledge our past,but move on from them and make an even brighter future for ourselves. Benny Rivera ‘13 spoke about remembering how the adults used to joke and reminisce about their high school days, and how we are doing the same. Tanaya Wright commented on how it was a great idea to have annually alumni dinners, since this particular came out as a success. Mr. Ersoz ended the marvelous night with the closing remark thanking everyone for coming and wishing them well in the studies. 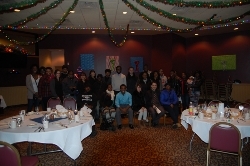 Each member of the Rochester Academy Charter School went home with gifts from RACS a RACS Alumni mug and a pen. What makes this Alumni so successful is that it show evidence that RACS has not left their student alone, but they are actively involved in staying connected with their former students and encouraging them to reach as far as they can. The turnout of the event highlights the connection that the Alums have among one another and with their former high school.